If you are going to be traveling to Denver in the near future, try staying in a fully furnished corporate rental. All properties listed below include all furnishings, linens, towels, bedding, housewares, parking, capped utilities, expanded basic cable, wireless high speed internet, and domestic long distance all for one great price. Brooks Tower Studio in Downtown Denver conveniently located to the 16th Street mall, Convention Center and Visitor’s Bureau, the Performing Arts Center, and tons of restaurants, bars, and shops. This unit has amazing views of downtown Denver as it is located on the 29th floor. The building has a full fitness center and a pool table. There is also an outdoor pool and sundeck for those hot summer months. The unit comes fully furnished and includes one garage parking space. To view more information about this unit or to reserve it today click here. 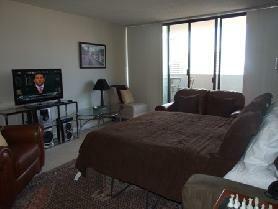 Gorgeous 1BD/1Ba 19th Floor Spire Condominium with beautiful artwork and furnishings. The unit features a stack-able washer and dryer, a large walk in closet, a large tub/shower combo, stainless steel appliances, granite counter-tops, cherry cabinets, 40″ Flat Screen TV in the living room and a 32″ Flat Screen TV in the bedroom. There is a built in work area with high speed wireless internet. 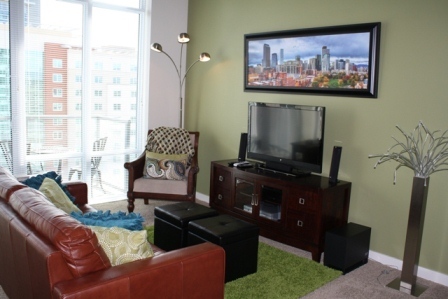 This unit features as-far-as-you-can-see views of the mountains and downtown Denver. The building has amazing amenities including an outdoor pool, 2 hot tubs, grills, meeting room with Mac Computers, extensive top of the line fitness center with brand new equipment, a zen garden, and theater room. To view more information about this property or to reserve it, click here. To contact us and to view all of our beautiful Denver properties, please visit us at: Denver.AvenueWest.com.